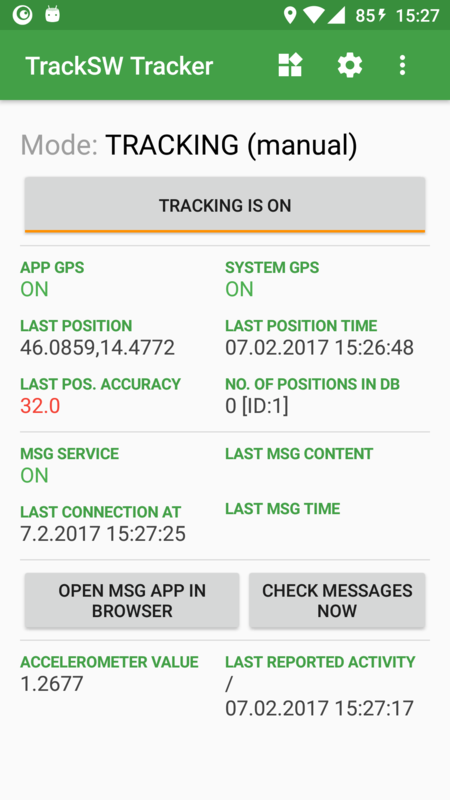 TrackSW GPS Tracker Android app can be used both for GPS tracking and as a Message notification service. 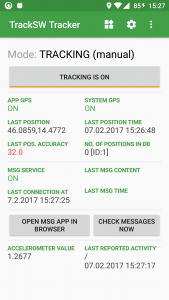 GPS tracking allows you to turn your android phone into a GPS tracker. 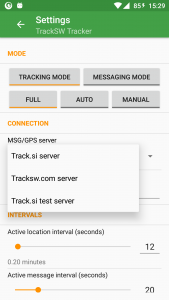 Similiar to a classic GPS tracking device, TrackSW GPS Tracker app sends GPS data to server, when it detects movement. 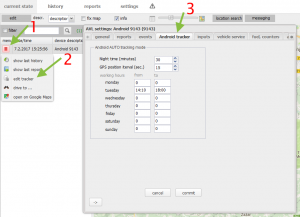 TrackSW Tracker can work in three different modes: full, auto or manual. 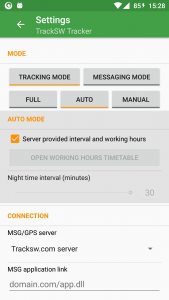 Besides mode you also have to choose the server to which GPS data will be sending to. To open settings, click on the gear icon in the top right corner ("Settings" in the menu). First, we can select in which mode TrackSW Tracker will work. Since we are interested in tracking, choose Tracking mode and then select the mode you want (how modes work is explained below). 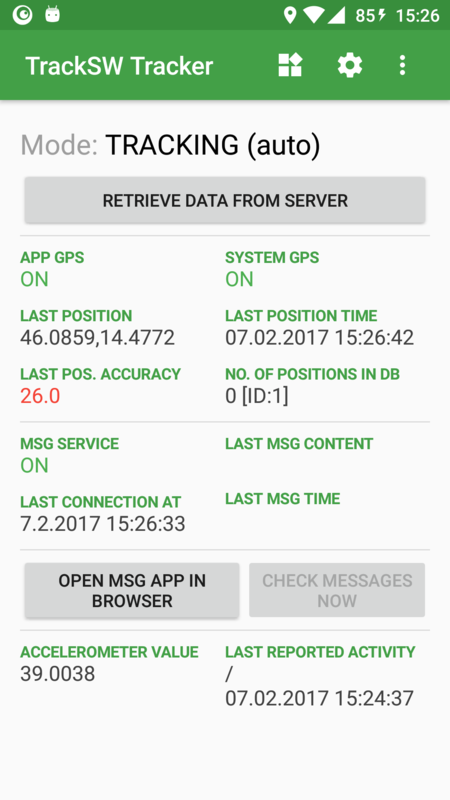 We also have to select MSG/GPS server from the drop-down list. Settings are automatically saved by clicking on back arrow in upper left corner (or pressing back key on your phone). 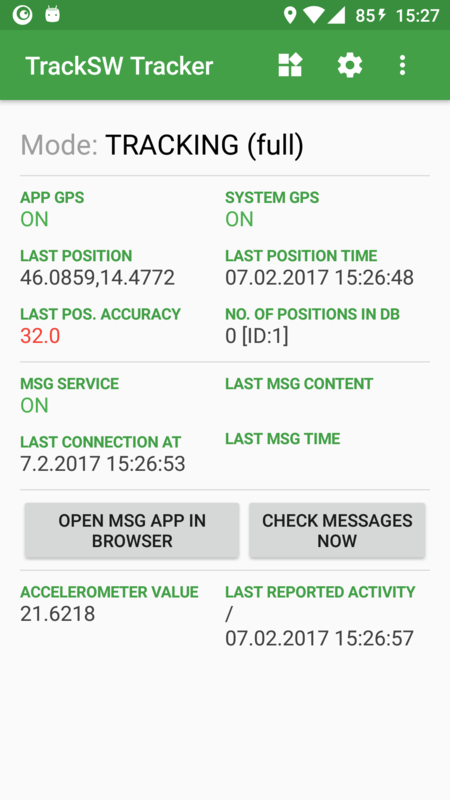 Example of main screen with manual mode tracking enabled: There's a button to start/stop tracking, and under it information about GPS/MSG service states, last position, last position time, etc. 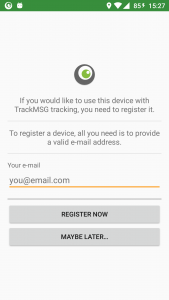 To start using the TrackSW Tracker, you need to register your device. Registration is simple: on main screen, open menu in upper right corner and click on Register device. A new window will open, where you can enter your e-mail and press Register now. 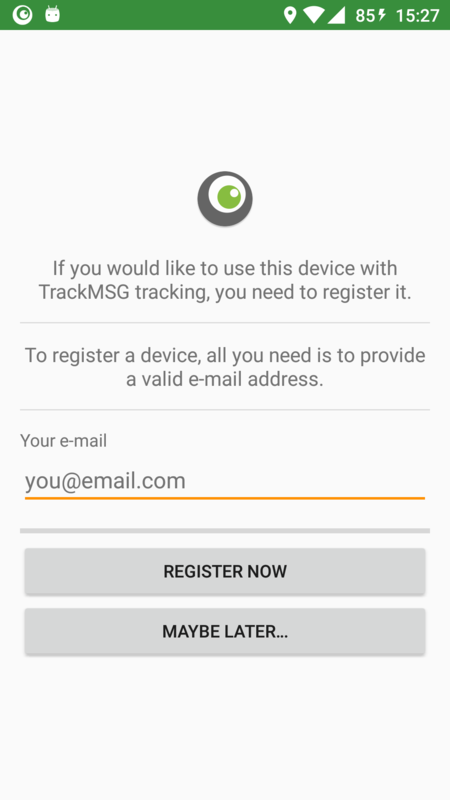 On the entered e-mail you'll receive your login data (username & password) for TrackSW WEB application, and TrackSW Tracker is ready for use! 1. Full tracking: Tracker will be on all the time, and will send GPS data when it detects movement. 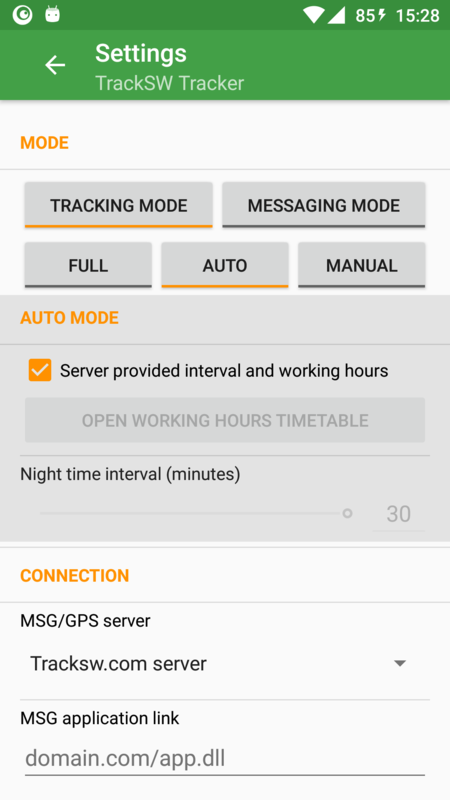 For using auto tracking mode, you need to set up intervals from when to when the GPS tracking should be active and night interval - time between each connection to server when GPS tracking is not active (periodical checks for changes in interval settings). 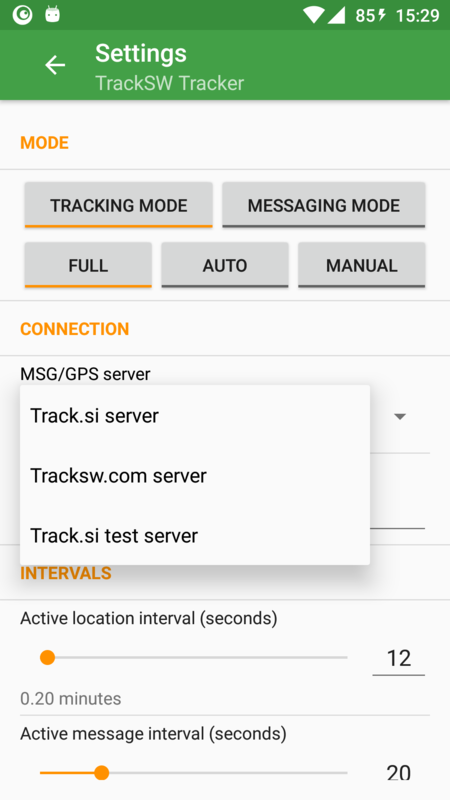 There are two ways to set up intervals: in the TrackSW Tracking app itself, or through the TrackSW WEB app. When we select auto in settings, a new settings category pops up (auto mode), here we make sure that the Server provided... is unchecked and click on Open working hours timetable. A table will open for editing. 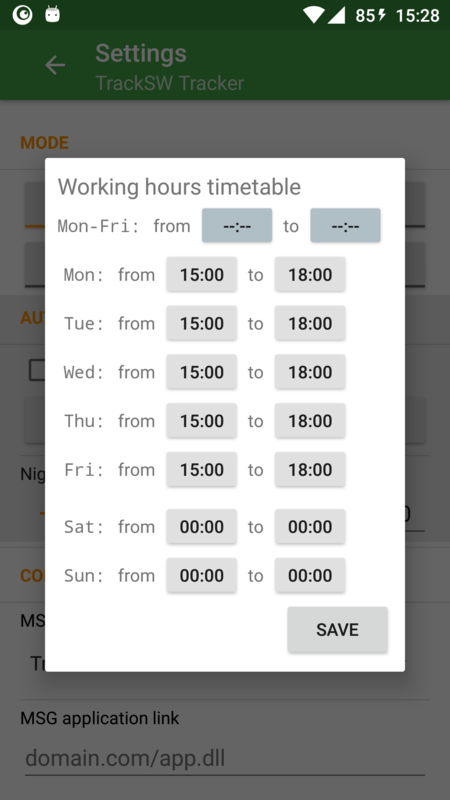 In first row, we can select time for all working days (monday through friday). If for some days we don't want tracking active, we can set times to 00:00-00:00. 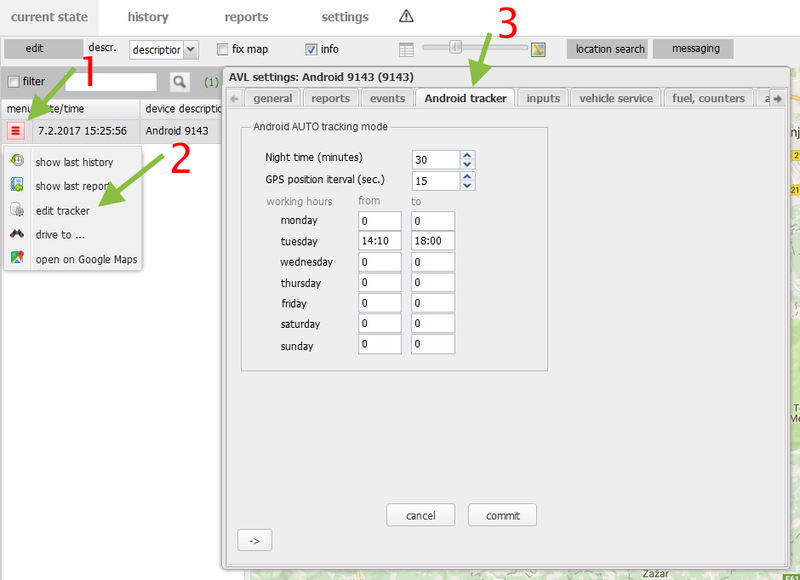 In category Auto mode, check the Server provided interval and working hours and save settings. 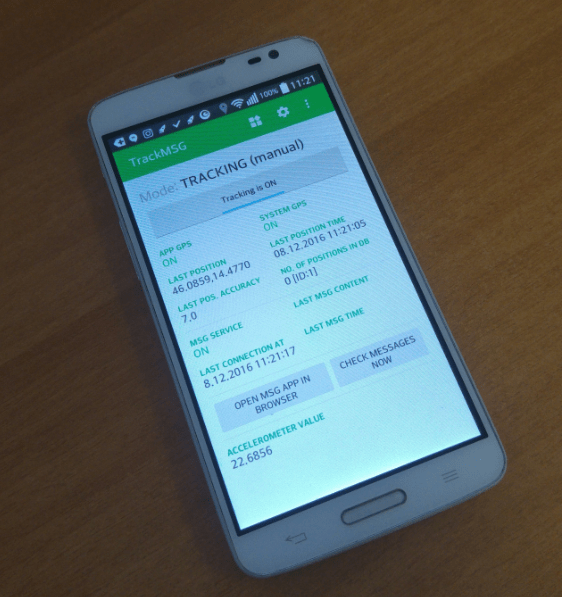 Open TrackSW WEB application with your tracker, open tracker settings and select Android tracker tab (see image). Here we can set the night interval and the timetable. 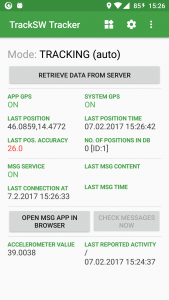 After applying settings in WEB application, we can click Retrieve data from server in main screen of TrackSW Tracker app to immediately apply new settings. 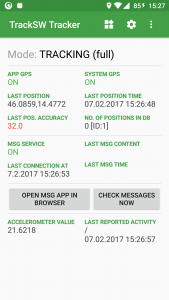 Active location interval: Time between two locations when GPS is active. 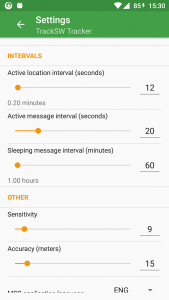 Sleeping message interval: Time between communications when MSG service is asleep. 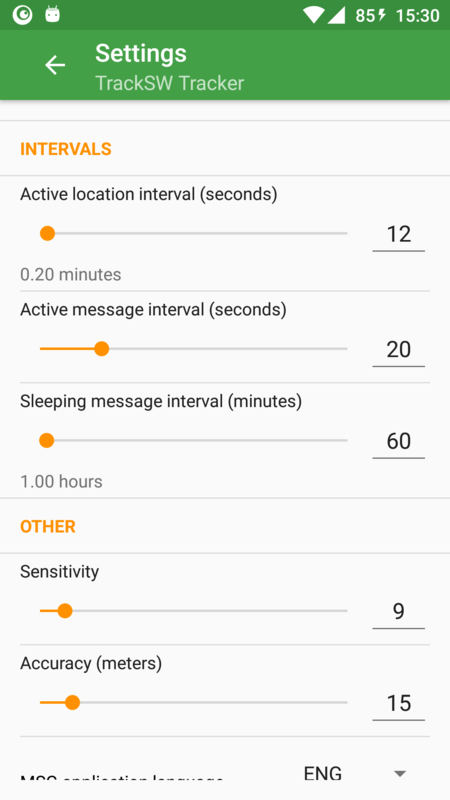 Sensitivity: How sensitive is TrackSW Tracker (max. sensor value before it wakes up from sleep). Different mobile phone can have different "default" values. You can read current sensor value on the main screen (Accelerometer value). Accuracy: How accurate the GPS location should be to be considered valid. Bigger value allows accepting less precise positions. Suggested value is about 15 meters. 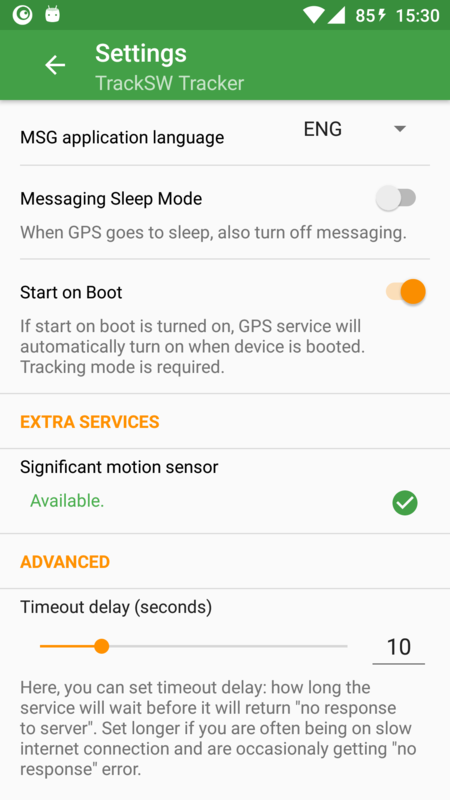 Messaging sleep mode: With this option enabled, MSG service will sleep together with GPS service (when there's no movement detected) and will additionaly save batter life. 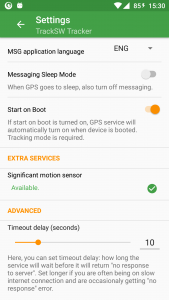 Start on boot: With this option enabled, TrackSW Tracker will start up when device is turned on.